Saint Casimir ( Šventas Kazi ieras), Lithuania’s PATRON AND ONLY CANONIZED SAINT, WAS BORN INTO THE ILLUSTRIOUS LITHUANIAN DYNASTY OF GEDIMINAS in Cracow, Poland in 1458. He was the grandson of Jogaila, Grand Duke of Lithuania, who accepted Christianity and ascended the Polish throne in 1386 with the name of Wladislaw. His father was Casimir Jogailaitis, Grand Duke of Lithuania and King of Poland. His mother Elizabeth was Austrian, a member of the distinguished HapsbLirg family. His Lithuanian relatives were very prolific. Gediminas is said to have had seven sons, not to mention daughters. Great-grandfather Algirdas, who died in 1377, left twelve sons. Casimir himself was one of a family of six brothers and six sisters. The dynasty to which he belonged prospered for three centuries. His relatives were to be found on thrones from Moscow to Madrid and Vilnrns to Vienna. At birth his future seemed bright indeed! In contemporary terms, he was a member of two dynasties, two powerftil families which together formed a multinational corporation. The future saint received a thoroughly western education under his tutorjan Dlugosz. His studies included the Latin and Greek classics, philosophy, history and rhetoric. He became fluent in Latin, the international langLiage of western Europe at the time, in addition to Polish and German. He may have learned some Lithuanian later on charing his visits to and residence in Lithuania. At that time, scholars such as Dhigosz and others believed the Lithuanians, who are neither Slavs nor Teutons, were descended from the ancient Romans. They considered Latin to be the highest form of Lithuanian which would once again be mastered by the Lithuanians in time. Therefore, no attempt was made to learn or study the Lithuanian language. Of course this misconception or false rationale was costly in the futLire development of the Lithuanian language and culture. Casimir was a particLilarly bright and even erudite yoLith. The Italian humanist Callimachais Buonacorsi remembered him as a particularly “divLis aclolescens” or “remarkable adolescent”. Under the infhience of his mother, the yoLing prince’s ftiture was seen to be somewhere in the then solidly Catholic world of central Europe. Elizabeth held many dynastic claims within the Hapsburg Empire, where she dutifLilly soLight suitable positions for her children. When the thrones of Bohemia and Hungary became vacant, she dispatched one son to Prague. 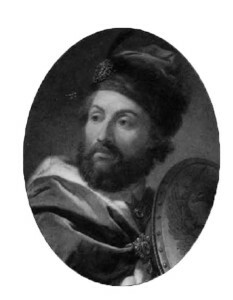 The thirteen-year-old Casimir was sent to assume the throne of Hungary. He arrived in 1471 with an army of 12,000, which included mercenaries and Tartar Linits. The HLingarians, however, were not favorably disposed to a teenage monarch from Cracow. The expedition failed and the prince returned home. father, Casimir Jogailaitis, ruled for 52 years. Although his reign brought relative peace to the country, it allowed for Muscovy’s threat to grow (Painting by Marceli Bacciarelli). After the effort to establish Prince Casimir as king of Hungary failed, his father became more directly involved in his futLire. Since his eldest son now held the throne of Bohemia, young Casimir’s role would be to become his heir to the thrones of Poland and Lithuania. In 1475 both Casimirs journeyed to Lithuania where they spent the Easter holidays and stayed there for some time. From this time on, the young Casimir w o l i I c! visit Lithuania frequently, staying either in Vilnius, Trakai or Gardinas. 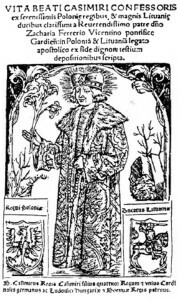 In 1481 King Casimir went to Lithuania where he remained for two years, entrusting the young prince with the duties of ruling Poland in his name. After his return to Cracow in 1483, the king again dispatched his son to Lithuania. While in Vilnius, Prince Casimir spent most of his time at the Chancery of the Grand Duchy of Lithuania where he performed many of the day to day administrative functions of Chancellor and Vice-Chancellor. The young and frail Casimir contracted tuberculosis and was unable to continue his duties. His mother took him to Gardinas where he died on March 4, 1484 at the age of twenty six. His body was brought to Vilnius and interred in the Cathedral which his grandfather built. He has remained in Lithuania ever since. When both Casimirs visited Lithuania, they found it in a state of unrest and turmoil. The final option of Christianizing the ethnic Lithuanian people had not gone as smoothly as many subsequent Catholic writers would have us believe. From the time of Mindaugas, who was born at the end of the 12th century and died in 1263, and later Gediminas and his heirs, the rulers of Lithuania realized that the power and prosperity of the dynasty and Lithuanian state rested on solid, cool-headed control of Lithuania by the grand duke and his family. Only the extensive royal family could dance the knife’s edge, maintain the balance of power, and juggle between east and west, pagan, Catholic and Orthodox. 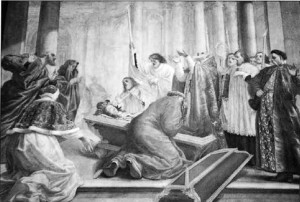 The opening of Saint Casimir’s casket in 1604. The painting by Del Bene hangs in Vilnius Cathedral’s Saint Casimir Chapel. With the decision by Jogaila to accept the recently canonized Polish Princess Saint Jadwyga in marriage together with Catholicism and the Polish crown in 1386, this delicate balance was forever disrupted. Jogaila and his cousin Vytautas the Great accepted Catholicism as the religion of the head of the dynasty and the Lithuanian nation. The Aukštaiciai (Highlanders) were officially baptized in 1387; the Žemaiciai (Lowlanders-Samogitians) in 1413- The Žemaiciai, who for 250 years had battled against the worst representatives of Catholicism, the Teutonic Order, were certainly less than enthusiastic about converting to Catholicism. And the animosity towards Rome among the eastern Slavic population of the Grand Duchy grew against the sovereign in Catholic Cracow. Family ties between Catholie and Orthodox members of the dynasty were no longer strong enough to keep the Lithuanian state unified by a neutral pagan leader. Only one of the stature’of Prince Casimir could temporarily stave off the frictions between the various Lithuanian factions. 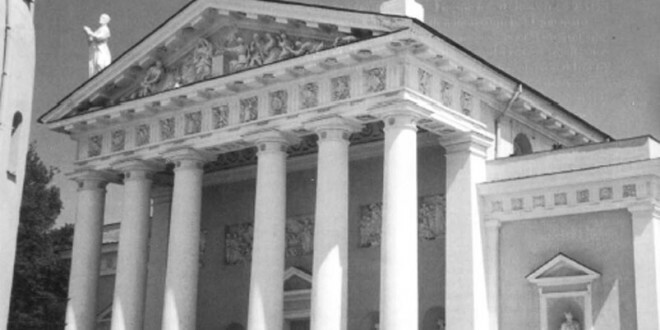 One group even made an unsuccessful attempt on the lives of the two Casimirs in Vilnius. The young prince was the best educated descendant of Gediminas at that time. He was intellectually bright, even erudite for his age, well-mannered and an excellent trained knight in the military arts. In addition, his character was beyond reproach. He was generally held in high regard by all except the most partisan of his political enemies. His piety, which included long hours of prayer and fasting as well as his dedication to chastity, especially as a single, handsome young man, was highly respected even by his father’s enemies. His accessibility and simplicity were much loved by the lowly, the “vargšai” of Lithuania. As heir apparent to both thrones, he offered Lithuanians hope that their interests would not be forgotten in far away Cracow. But his early death opened new avenues for foreign intrigues, particularly from bellicose Muscovy. Soon after Casimir’s passing, popular devotion around his person began to develop among the ordinary people. His father was particularly devastated by the loss of his promising son. He made the usual offerings to the church in his son’s memory. Miracles, including various cures, began to be reported and credited to the intercession of the young prince. During the 16th century, devotion to the not yet canonized saint was spread by the Jesuits, especially among students and Belarussian eastern rite Catholics in union with Rome. In Lithuania devotion to Saint Casimir gradually took on a distinctly anti-Russian tone well into our time. He was credited with the victory of the Lithuanian army over the Muscovites at Polotsk in 1518. Following the victory, Saint Casimir was “excommunicated” posthumously by the pro-Moscow Orthodox Bishop of Polotsk! He was credited in intervening on behalf of Lithuania against invading Russian and Swedish forces on several other occasions. In 1655 his remains were hidden to avoid being desecrated by Muscovite troops advancing into Lithuania. Canonization in the Catholic Church can be a long-drawn juridical and political process. The Church does not “make people saints”. It declares their sanctity for all to know. Although “canonized” by the people, Saint Casimir’s formal process of canonization took many years. Some thirty five years after his death, Pope Leo X sent his representative Zacharias Ferreri to investigate Saint Casimir’s life and miracles. The result was a modest little book of 28 pages, entitled Vita Beati Casimiri (The Life of Blessed Casimir). Some would find the booklet rather disappointing and even rather “ordinary” for a saint of the Catholic Church. Perhaps that is what makes Saint Casimir so attractive and ever appealing to Lithuanians throughout the ages. He was to be sure, well born. He was also pious, honest, chaste according to his state in life, given to long hours of prayer and meditation and had a strong devotion to the Blessed Virgin Mary. His political influence in Lithuania after his death was more pronounced than during his life. Saint Casimir’s canonization process, which was started by Pope Leo X before 1521, was completed only in 1602 by Pope Clement VIII. A great jubilation followed in Vilnius during which time the saint’s coffin was opened and his remains were found incorrupted after 120 years. This event was immortalized in a 1690 painting by Del Bene which hangs in Saint Casimir’s Chapel in Vilnius’ Cathedral Basilica. 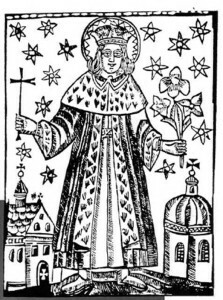 Devotion to Saint Casimir spread rapidly not only throughout Lithuania but also to other countries. It was strongly felt in Poland, Italy, Belgium, Germany, Malta, even South America. The Knights of Malta who fought the Turks chose Saint Casimir as their patron because he too had encouraged war with them. And in Venezuela a town not far from the capital city, Caracas, was named after him. Hundreds of parishes and dozens of organizations in Lithuania, America, and other countries bear his name or regard him as their patron. The silver casket rests elevated above a famous icon of the saint. 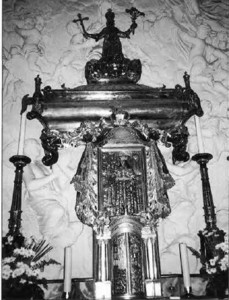 In 1953 the Soviet authorities exiled Saint Casimir’s relics from Vilnius Cathedral to Sts. Peter & Paul Church in Antakalnis, a suburb of Vilnius. 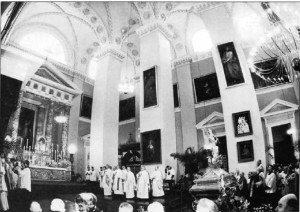 The silver coffin with the saint’s remains was returned in triumph to the Cathedral on the eve of the regaining of Lithuanian independence on March 4, 1989. Somehow, although Saint Casimir was a prince, ordinary people can relate to him, particularly the young, the chronically ill and the laity. He died in a rather comfortable bed as most of us hope to. He was not called upon to be devoured by lions, skinned or burned alive as were many martyrs. Nor did he run from life. He lived what was given him well. Perhaps these are characteristics which most ordinary Christians can admire and easily relate to today as in the Lithuanian past. Although sometimes presented as a rather ethereal figure in holy card images, there is something very real and approachable in this beloved saint which attracts Lithuanians as well as those of other heritages in a compelling way.